[San Francisco] Let's meet at GDC 2018! 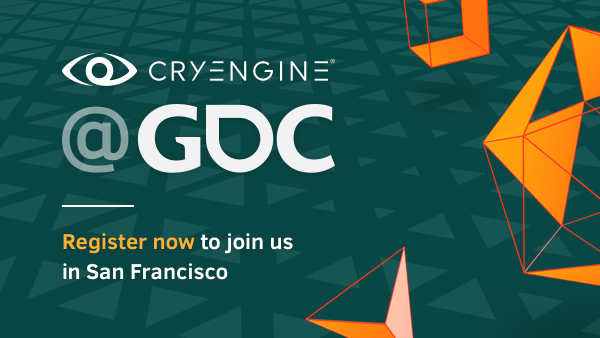 The CRYENGINE business team is coming to Game Developers Conference 2018 in San Francisco. CRYENGINE business solutions have something in stock for everyone; no matter if you are focusing on middle-ware, game development, VR applications or looking for your next big investment - we offer a wide range of services and tools to realize your vision. Just register below so we can get in touch to discuss new business opportunities for 2018 and beyond. Re: Let's meet at GDC! I can See new documents CE 5.5 at GDC 2018 ? Is possible , I Know , add C# Component like as Fog Component/ Light Component /etc to CE 5.5? Well , What is news of Video/Keynotes/Conference at GDC 2018 about CE 5.5 P ? Those was video tutorials/a video Conference, CE Team want upload on the Official Youtube Channel ?